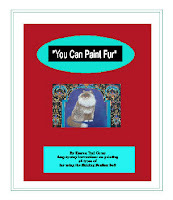 NEW>>>>Book and DVD Set "You Can Paint Fur"
Learn how to paint fur! 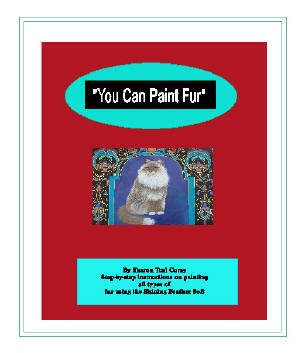 This is a new book on CD and a DVD showing how to paint fur with the Shining Feather Soft Stroke brush. 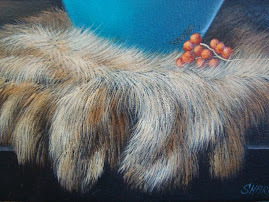 See how Sharon uses her brush to create beautiful realistic fur. The book is 52 pages and includes up close photos of fur in all colors. 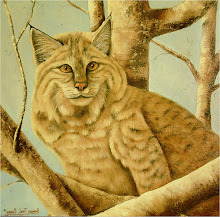 Sharon's favorite colors for fur using oils and acrylics and two full instructional patterns to paint that includes fur. One is a still-life and the other is a long haired cat. This is a complete book on how to paint all types of fur! The DVD actually shows Sharon painting fur using her brush. You will watch her build a beautiful piece of fur plus how to load and use the brush properly to achieve gorgeous fur! Anyone can paint fur with this set and the Shining Feather Soft Stroke brush. This is the "Shining Feather Soft Stroke" Brush the one and only! This brush is one of a kind, it is manufactured by Scharff Brushes and then "hand cut" by Sharon, she developed this brush over 30 years ago for herself and her students. It is NOT a filbert rake, cat's tongue, script liner, wisp or fan brush....it is totally unique! These brushes are all cut by machines and will not create beautiful fur like the Shining Feather Soft Stroke Brush. Most are too stiff or have way too much filament which will not produce the results you want! 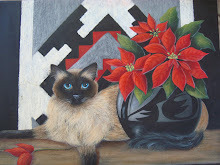 It was not available to the general public until 2003, when it was introduced at the Las Vegas Painting Convention. Since then it has sold to hundreds to artists all over the world! Each brush is carefully hand cut and tested to make sure it will perform before it is sold. *Don't settle for the knock-offs....that are cut by machines! *You have tired them all so why not try the only one that works! *They don't work like this brush and and won't last as long! *They are simply a waste of your money!